So far there have been no blockbusters at the hearing. Ford read an opening statement with a noticeably shaky voice, repeating the allegations she’s made from the start. The format is strange: every senator has five minutes for questioning, but the Republicans have turned their questioning over to a professional prosecutor, Rachel Mitchell. So each Democrat takes five minutes, then Mitchell takes five minutes, and so forth. I’ll bet no prosecutor has ever had to question a witness like this before. 11:10 — Patrick Leahy asked Ford for her most indelible memory of the attack: “the laughter between the two, they’re having fun at my expense.” This was delivered in a very shaky voice. On Fox News, Bret Baier says hearing from Blasey Ford “is a totally different thing” than reading her allegations. 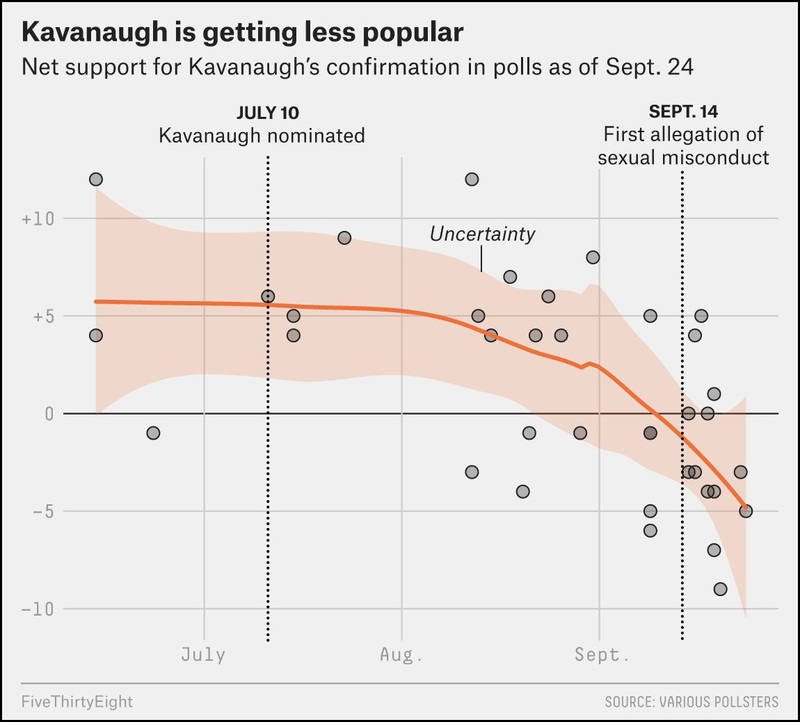 I have a feeling that’s going to keep plummeting after today’s hearing. 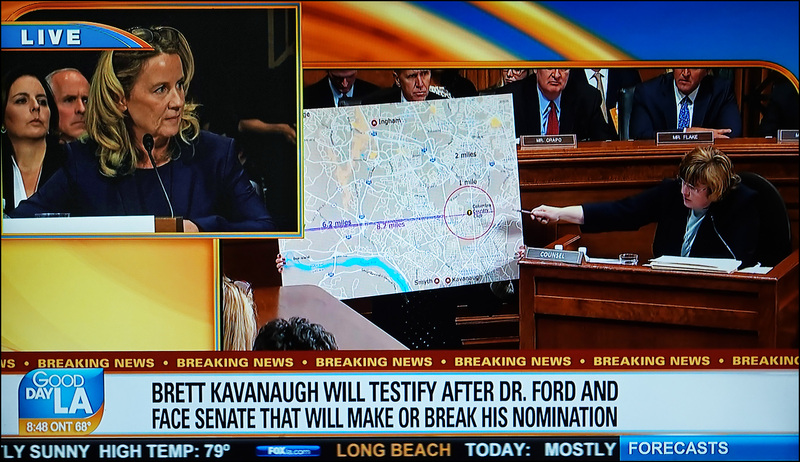 11:50 — Mitchell is putting up big maps showing the location of the “country club” and Ford’s parents’ home, where she lived at the time. So far, though, there’s no follow-up. What was the point of the maps? 12:00 — Mitchell is now going on and on about the fact that Ford has flown in an airplane many times even though Ford says that the Kavanaugh attack gave her lifelong claustrophobia. Is this leading up to some suggestion that, well, maybe the attack wasn’t all that bad, was it? But I can’t believe Mitchell will go there. She’ll just leave the implication hanging. 12:15 — I get that prosecutors are trained to go over the evidence slowly and in detail. You never know when something will pop up that you haven’t heard before or that contradicts previous testimony. But I’m genuinely not clear why Mitchell is going over the minutiae of Ford’s decision to come forward. What can she possibly get out of this? 12:30 — Mitchell wastes more time asking Ford the dates she talked to Rep. Eshoo and Sen. Feinstein and when she hired a lawyer. Maybe this is leading somewhere and there’s going to be a big Perry Mason moment at the end, but I sure don’t see it yet. 12:40 — I wonder if Mitchell has any idea how badly her performance is being panned? Why is Rachel Mitchell burning up her time with questions about Christine Ford’s fear of flying, the geography of her neighborhood, and niggling details about how she first informed a local official about these allegations? Is there a hidden method here that we’re all missing?